Saturday Morning: Scott, Brian, and I make breakfast for our wives. Pancakes, sausages, and scrambled eggs. We could open a breakfast joint if we wanted, it's that good. Brian and Kristy bring over DVDs of Batman and we watch cartoons. I haven't watched Saturday morning cartoons in years; I highly recommend it. 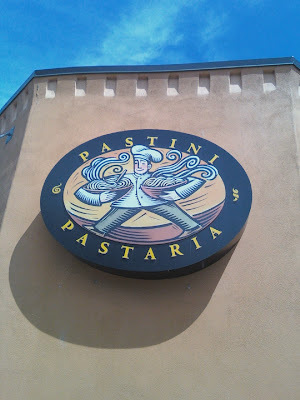 Saturday Lunch: Katie and I go to our favorite Portland restaurant--Pastini Pastaria. Katie goes with her best friend, Cindy to the one on NW 23rd. I go to the one in my old SE Portland stomping grounds with Scott and Brian. I eat the baked ziti and literally die from the tastiness. Thankfully, I am miraculously resurrected. I also purchase a pound of Stumptown coffee nearby, which causes me to die again, this time from happiness. I resurrect again moments later. Two resurrections in one day; not bad. Saturday Afternoon: Katie and Cindy talk for 4 hours straight. Katie really likes Cindy. The three amigos go to Portland's waterfront park to briefly see Luis Palau's CityFest. We then head to Powell's--the coolest and largest independent bookstore in the world--where I wander around drooling puddles onto the literature. The aroma of worn paper and espresso fills the building. I buy Life of Pi on sale (after getting permission from my lovely wife). If I were a book, I'd want to be purchased at Powell's. Saturday Evening: I meet up with Katie and Cindy and head down to the Portland Art Museum for a wedding. Our friends getting hitched, Jon and Meagan, met at our wedding two years ago. They are two amazing people that we love a lot, and it is a beautiful wedding to witness. We see lots of people from our past; it's a bit overwhelming at times, but it's a fantastic time to reconnect with old friends. I only wish we had more time to talk! We stay until 10 PM, then drive back with Cindy and Jason (Cindy's uber-cool husband), stopping to grab Burgerville before going to bed. Burgerville + late nights + no longer in college = feeling like gerbils are gnawing through one's stomach wall. Sunday Morning: We go to Imago Dei for church and meet up with lots of friends, including Katie's sister Amanda and her fiance Aaron (seen above). Imago is one of the most refreshing churches I've been to; they share stories about recent trips to Africa to see their brothers and sisters in Christ and I get the chills, it is so beautiful to hear. Afterwards, we grab coffee at the new Albina Press on Hawthorne (my old stomping grounds again), then head to the Deschutes Brewery and Pub in the Pearl District for lunch with friends from the wedding. Having never been to either the coffee house or the pub, I fall in love with both. 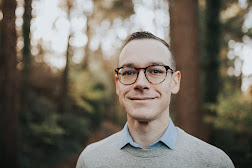 I chat a lot about Uganda with Brady of Global Support Mission and how RMCC's junior high group can connect with GSM in the spring. Brady is an intelligent and creative guy, and I always leave our conversations feeling refreshed. We leave the pub wishing we could hang out more with Amanda and Aaron! Sunday Afternoon: Exhausted, we head back to Scott and Stef's place to find the Nintendo Wii that Brian and Scott had purchased for my upcoming birthday while I was headed to Imago (we paid them back for it, but they stood in line outside Circuit City to get one; they're still that difficult to find!). We lazily chill with our friends, then pack and head to the airport as the Oregon skies turn gray and begin to drizzle. During one conversation with our friends over the weekend, Kristy asked a question she read from a card found in the Chases' home: what is one place or location you're spiritually connected with? 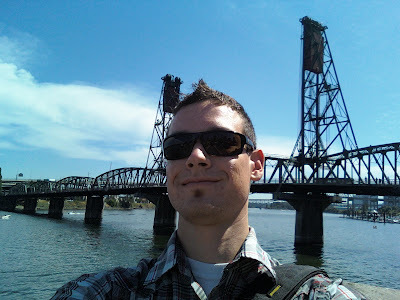 While some might say "the ocean" or "a mountain top" or "alone in my room," I'd have to say that I have a spiritual connection with the city of Portland. Despite its gray weather, crappy left-turn signals, and the outrageous amount of weird people, there is something vibrant that comes alive in me when I am sipping its espresso, strolling through its parks, or avoiding getting plowed over by its bikers. I simply love this city and the people in it, and I imagine that as God moves in and through the city, He is loving it too.